Sipsey Street Irregulars: "Waco Jim" raids Sabre Defence: What cluster coitus has the ATF gotten itself into now? "Waco Jim" raids Sabre Defence: What cluster coitus has the ATF gotten itself into now? My thanks to JPR9 for forwarding this. Waco Jim Cavanaugh and his F Troop are up to their old tricks again, although at least this time him and his Fibbie buddies didn't burn down a church with the congregation inside. I'm merely waiting to see what cluster coital situation or egregious infringement of liberty the ATF has generated this time. Past experience dictates there there WILL be something. Count on it. For those of you who are unfamiliar with Sabre Defence, go here, here, and here. Federal law enforcement agents, led by the Bureau of Alcohol, Tobacco, Firearms and Explosives, descended on Nashville's Sabre Defence Industries this morning and closed down the facility for at least the day. After almost all of the employees had left the premises, agents brought in a trailer and backed it up to the company's loading dock. Investigate church burnings, burn them down yourself, its all in a well-rounded career for "Waco Jim." 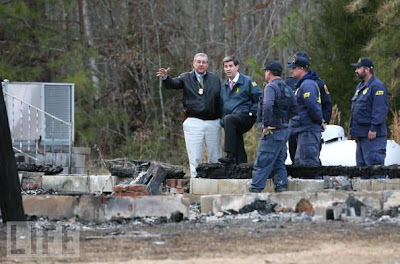 Here he tells Alabama Governor Bill Riley at the scene of a church arson what amateurs they're dealing with. Now THAT'S a church burning. 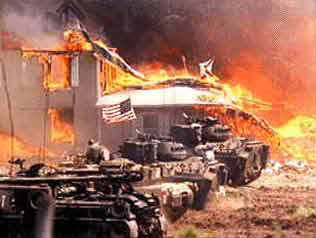 Federals put amateur arsonists to shame, 19 April 1993. I'd love to see the search warrant that gave them authority to search every employee and all those private vehicles. Talk about a freaking fishing expedition. Jack booted thugs hardly seems sufficient. Well, the Batt Fays have out done themselves on this. I am very familiar with this company, they make very high quality AR-15 barrels, upper receivers, and whole rifles for commercial sale; all in addition to their military contracts. 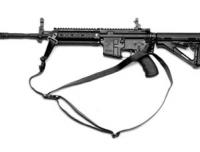 They are a licensee for the production of 6.5 Grendel AR's as well as the more common 5.56NATO rifles. "Toad" Cavanaugh has got to go, one way, or another. I wonder who they pissed off Mike. Seems hard to believe they'd jeopardize those FedGov contract. I wonder if there's any chance of a link (however tenuous) to Tennessee's Firearms Freedom Act? To call this bunch jackbooted thugs would be an insult to jackbooted thugs everywhere. Does this seem to indicate that the FUs have now solidified their desire to paint an 'Enemy Combatant' sign on every one of their JBTs from coast to coast? 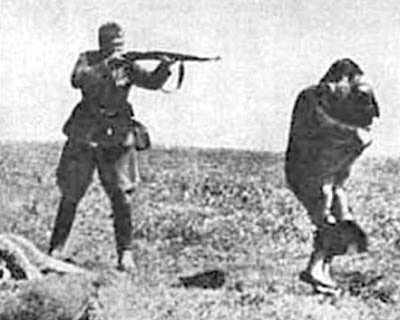 It appears that they wish to be seen as the SS... and in some places Partisans targeted any SS that they could identify. History repeating, or unintended consequences? 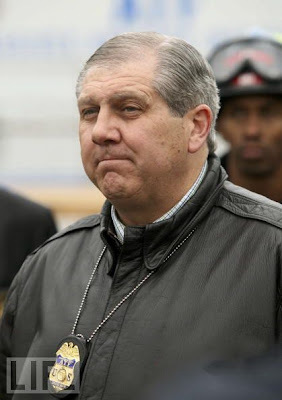 Cavanaugh's face betrays his being. He's one ugly mither fracker. Bat Fecals' way of saying, "If you want to stay in business, come out publicly against the 10A effort" ? Traditional corruption, someone going after Sabre's business by hiring gov't thugs? Elements of the Obongostration settling political scores? There are posts on ar15.com that claim an employee was stealing (or making on their own time?) select-fire receivers from the company. That's the reason why they were searching employee vehicles. Oh, one other thing that Sabre makes is AUG receivers (and some other parts) for the civilian-legal AUG A3 rifles offered by Steyr USA. This is about Tennesee's new firearms manufacture act that flips off the feds. Ok, question: This is a gross violation of that law, so where are the Tennesee STATE POLICE and the resident COUNTY SHERIFF to stand between the LAWFUL operation of a PRIVATE business and the UNLAWFUL violation of STATE LAW by the feds? As Anon 2:53 said, there is some speculation that this is connected to the continued harassment by BATFEces to Cav Arms, and their current attempts to sell their firearms division (to an as-yet-unknown company). Appears that between Cav Arms, Sabre & ATI, that the BATFEces have been keeping themselves busy little bee drones. How far will this nonsense go before some freedom-minded individual says "Enough" & fires the first shot in AmRev II? My guess is that this raid is directly related to the fact that Tennessee is attempting to exercise its 10th Amend. states' rights. The state did pass a bill that told the feds that they had no jurisdiction over arms mfgd. and sold within the state. You know that ticked off the ATF. "Our model is rather Lexington and Concord. The British marched out, not intending to start a war but merely to carry out a lightning strike as they had during the Powder Alarm of 1774 and to be back in Boston before the "provincials" could react." Sounds like a clear case of Sabre's people forgetting to donate to the ATF "Widows and Orphans Fund". Not that I'm implying anything, mind you, because I don't want to come home to find my wife burned to death in our house, but I'd say if one were privy to the financial records of employees of a certain non-Constitutionally legal Federal agency, one might be surprised to find deposits significantly above the range of what one might expect a government salary man to make. Don't miss this one either. Praxis: Interesting. A "Long Range" Crossbow? I think Denninger has been reading my stuff . . .
Once again, the Internet crashes at home. Paul Krugman's Shamanistic Election Night Party. A Message for Vatic . . The other side of tragedy. Internet down at home, slow posting ahead. David Codrea catches ATF playing "Where's Waldo?" NRA cheese dicks at it again. Logistics: Polish 7.62x54R on strippers.